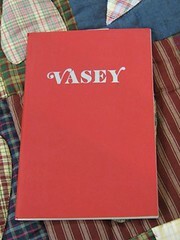 I am interested in obtaining the book “Vasey” covering the family of Richard Vasey and Sarah Wood. I am a descendant of Sarah Vasey who was Richard Vasey’s sister who was married to William Peatman and resided in Montreal. Could you please advise the cost of this publication and how I can order. Thank you for contacting us regarding this book. The cost of the book is $12.95 plus shipping. I will post shipping costs here as soon as I can. You can contact our retail sales manager at retail@huroniamuseum.com for further information. Thank you!